Dr. Yocum graduated with a BA from the University of Oklahoma with a special interdisciplinary degree in Catholic studies. She then attended Marquette University where she completed a doctorate in theology with a research specialization in the theological dimensions of U.S. Catholic life and thought in the nineteenth and twentieth century. Prior to coming to the University of Dayton in the fall of 1992, she was an assistant professor at Loyola College of Maryland and Saint Mary's College in South Bend, Indiana. She has published articles in encyclopedias and several journals including Theological Studies, Horizons, Church History, U.S. Catholic Historian. She co-edited American Catholic Traditions: Resources for Renewal with William Portier. She is frequently asked to give public lectures; most recently for the convocation for Saint Thomas Aquinas Day at Ohio Dominican University (2003). 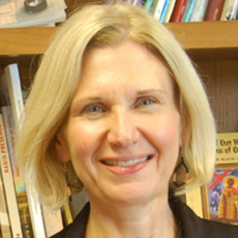 She has served on the boards of the American Catholic Historical Association and the College Theology Society. She currently serves as president of the Association of Graduate Programs in Ministry and is a member of the board of the American Society of Church History. For the past few years, she has been the Director of Graduate Studies in Religious Studies and is chair of the Department of Religious Studies. She received the 2003 Lackner Award in recognition of her contribution to the Catholic and Marianist character of the University of Dayton.